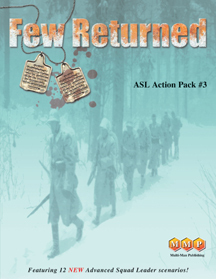 ASL Action Pack #3 - Few Returned is a scenario bundle featuring the Italians in World War Two. The scenarios represent actions on the Eastern Front fighting the Soviets and in Italy fighting their ex-ally, Germany. Researched and designed by Mark Pitcavage, Few Returned is sure to be enjoyed by veteran ASL players. Note: board 42 has a printing error on it, Multi-Man Publishing will be posting an overlay for free download to fix this issue.